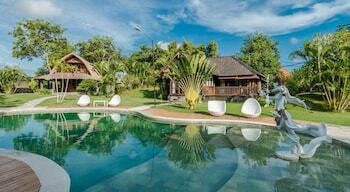 With a stay at Green Umalas Resort in Kerobokan (Kuta Utara), you'll be 14 minutes by car from Batu Belig Beach. Featured amenities include dry cleaning/laundry services and luggage storage. A roundtrip airport shuttle is provided for a surcharge (available on request), and free self parking is available onsite. With a stay at Airy Eco Renon Tukad Badung Dua Puluh Satu Blok C 9 Bali in Sanur, you'll be within a 15-minute drive of Consulate General of Japan and Bajra Sandhi Monument. With a stay at RedDoorz @ Lombok in Bandung (Sumurbandung), you'll be within a 5-minute drive of St. Peter's Cathedral and Riau Street Factory Outlets. Free self parking is available onsite.